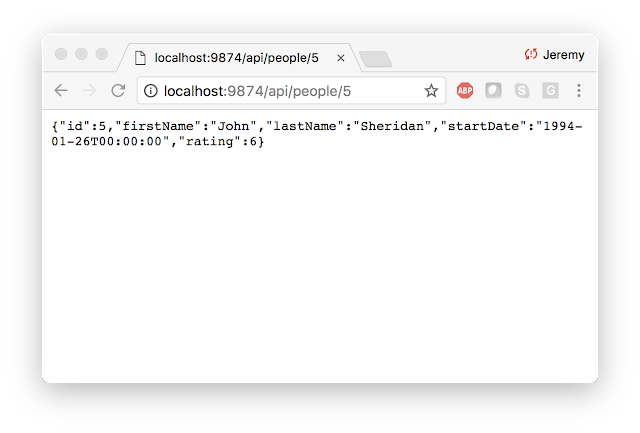 Let's build a WebAPI service using .NET Core 2.0. It's quite a bit easier than I expected (although I have seen some pretty cool demos of folks building things very quickly). I'm using the command-line interface (CLI) along with Visual Studio Code for editing code files. Note: .NET Core 2.0 Articles are collected here: Getting Started with .NET Core 2.0. I've been working with .NET Core 2.0 for about a week now, and other than having a bit of trouble with some of the samples, I've been enjoying the pieces that are there. I've posted an initial port of my Task sample code, so let's take a look at how I built the service project. 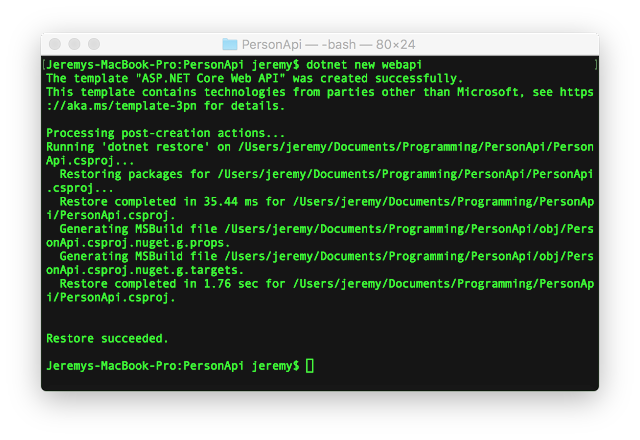 Note: This code is available on GitHub: jeremybytes/person-api-core. This article shows how to create a service that another application will consume. We'll look at that other application in a future article. 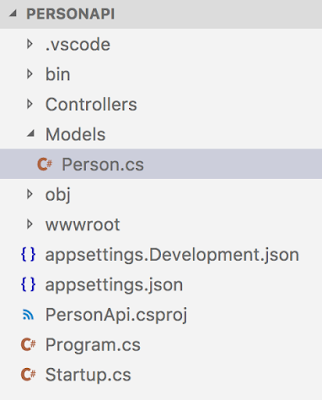 I'm starting with (1) the .NET Core SDK, (2) Visual Studio Code, and (3) the Visual Studio Code C# extension already installed. You can check the resources on the Microsoft announcement article to get the environment set up. It doesn't look all that exciting, but it's data that we'll use in other projects. And as we'll see, there aren't too many steps to get here. As I mentioned, I'll be using the command-line interface (CLI) in a bash window. I'm doing this work on macOS, but this will work just the same in PowerShell on Windows. 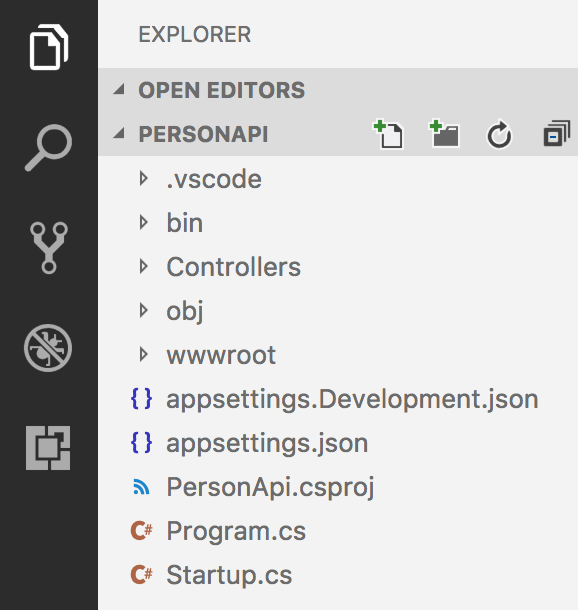 From here, we can open the "PersonApi" folder in Visual Studio Code. Just say "Yes" to this. It will add a ".vscode" folder and a few other files to the project. There's not a lot here -- and that's good. We don't have to learn a lot of things to get started with this. and we'll see that things are building successfully at this point. Now let's add a few things to get the data that we want. Since this is a WebAPI project, we'll expose our service by creating a Controller. But we'll need a new type and some data for our controller, so we'll start there. We'll add a "Models" folder to the project. We can do this either from the command line or with the "New Folder" button in Visual Studio Code. 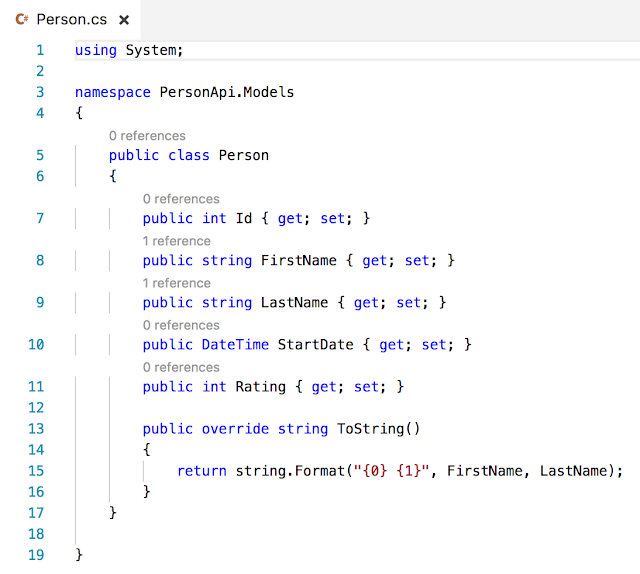 Rather than getting the data from a database using Entity Framework (which we'll look at in the future), we'll just use some hard-coded records. Now that we have our model in place, we'll add the controller. 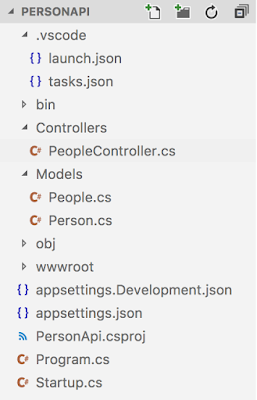 The initial project already contains a controller called "ValuesController" (in the "Controllers" folder). Rather than starting from scratch, we'll just re-purpose this one. 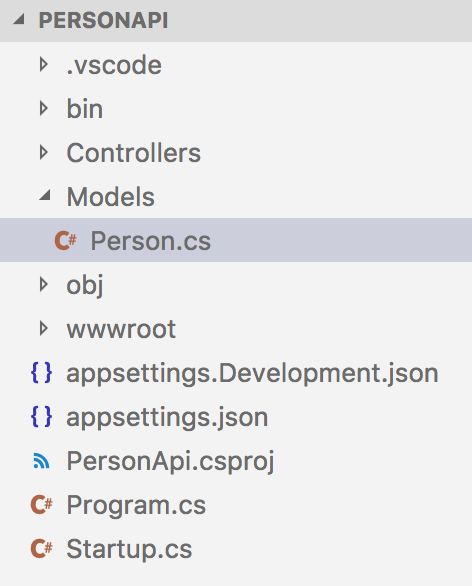 First, we rename the file from "ValuesController.cs" to "PeopleController.cs". Next, we'll update the code in the file. 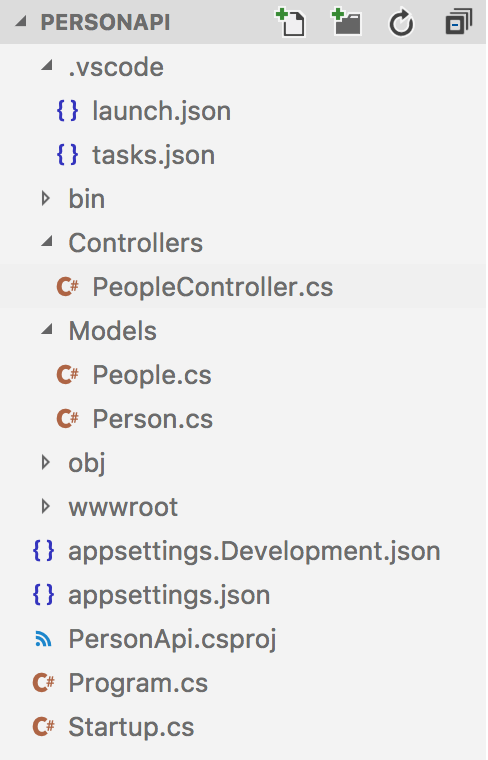 (This is available on GitHub: PeopleController.cs. But it's probably easier to simply type over the code that's already there). 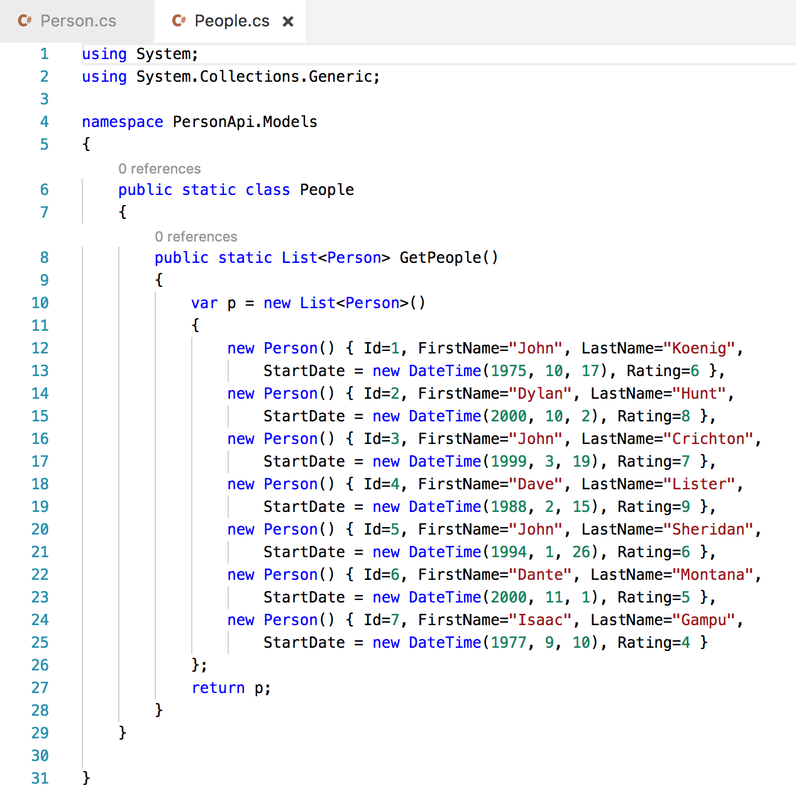 And the we can use the static method from the People class: GetPeople(). The "Get()" method returns the entire collection, and the "Get(int id)" method uses a bit of LINQ to pull out a particular record based on the integer id. 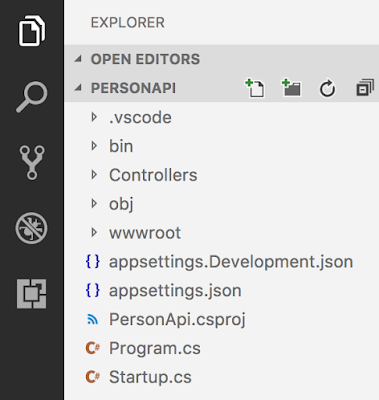 Note that when we use "dotnet run" on a folder, it looks in the ".vscode" folder for instructions on what to do (this was added for us by Visual Studio Code when we added the required assets above). The default configuration will build before run, so that means that we do not need to have an explicit build step here (although it doesn't hurt). This is all we need to get a service hosted for testing. Pretty cool, huh? The last thing that I want to do is change the port that the service is hosted on. There's no need to change this for our sample, but my other code uses a consistent port for this service: 9874. So I'd like to use the same port here. The "UseUrls" method lets us put in a custom address. to kick things off again. 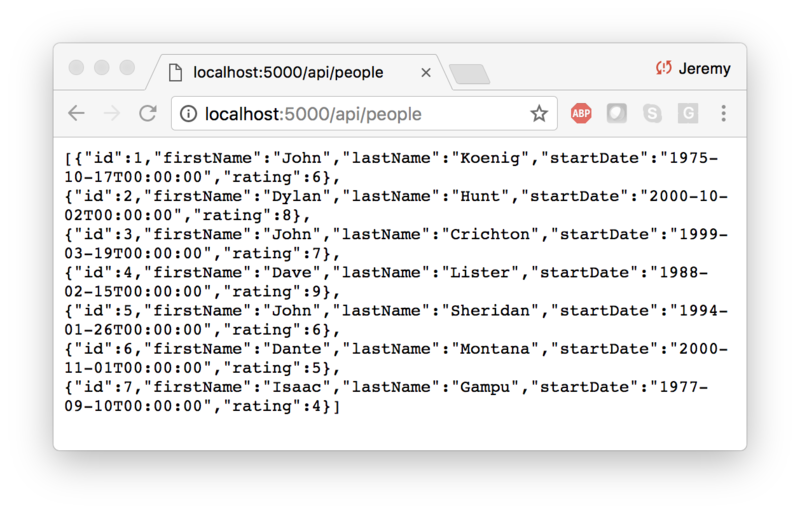 We can also pass an ID to our API to get an individual record. There are lots of cool things that I like about this. The biggest thing I like about this WebAPI project is how few files there are. I started using ASP.NET MVC back with version 2. Back then the default template had about a dozen files/folders when you created a new project. With more recent versions, there are dozens of files, and I have difficulty just trying to figure out which configuration file to use for a particular feature. The main reason for my difficulty with the full MVC template is that I don't use it very often. And I think about that as a barrier to entry to new developers. If I walked up to the giant template of files for the first time, I think I'd say "this is too complicated" and walk away. That's it. 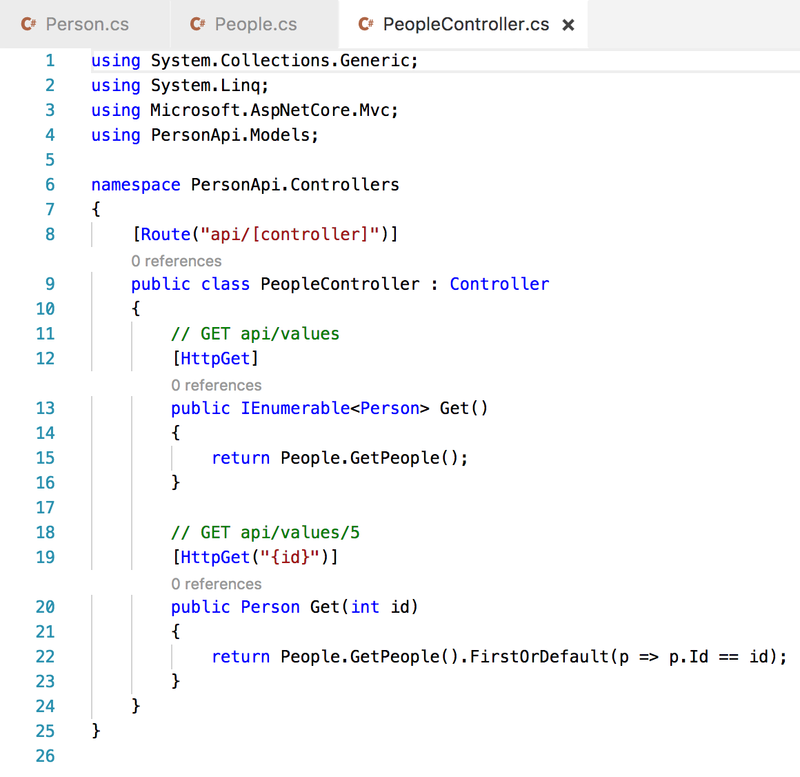 Of course, it helps that I have some ASP.NET MVC experiences, so I understand the conventions around the Controllers and how they are called. But even without that knowledge, I wouldn't be overwhelmed by this folder structure. 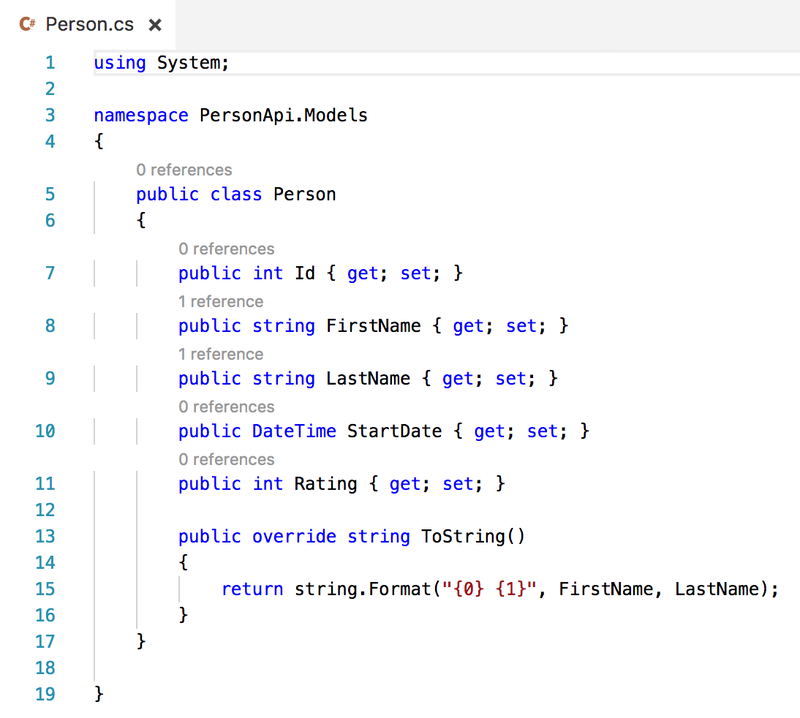 I'll be looking forward to digging into ASP.NET Core a bit more. I really like how easy it is to get a self-hosted website up and running. For many of my demos, I have a self-hosted site to supply data to the application. This is really easy, and I don't have to worry about things like IIS Express or trying to set up a full IIS server on my machine. There are a few things that have taken me a bit more time to get used to. I haven't been a regular user of Visual Studio Code, so I've been making some adjustments. For one thing, I'm used to Visual Studio where a "Build" also automatically saves the files first. Visual Studio Code doesn't do that. So I've gone through a couple "why aren't my changes working" when running applications. I just have to get used to saving things before running from the command line. I've also had to readjust somewhat to using the command line. I intentionally headed for the CLI tools (as opposed to the tools built in to Visual Studio or Visual Studio Code) because I wanted to understand the commands and how they work. Fortunately, I've got quite a bit of experience with bash in my past (although most of it is 15 years in my past). But that bash experience is helping me out quite a bit. The purpose of this project is to port the sample code from my Task & Await talk. This is the service piece. I've already written the Task code which shows consuming an asynchronous method, cancelling the process, and dealing with exceptions. I'll be showing that in the next article. (Hey, look! 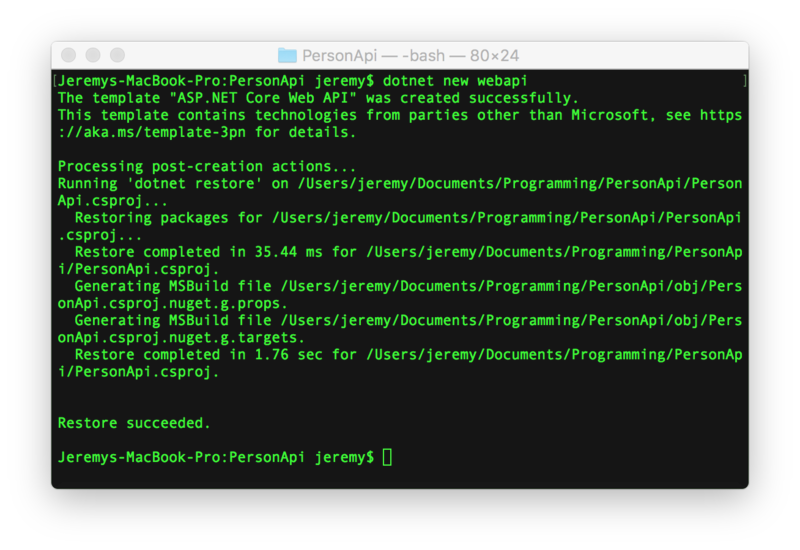 It's here: Consuming a WebAPI Service with .NET Core 2.0). And I'll be exploring .NET Core more and more. I'll probably head into unit testing next. xUnit.NET supports .NET Core, and I'm sure that other frameworks aren't far behind (if they're not already there). I've also seen some good demos on Entity Framework Core, so I'm sure that I'll be looking at that in the near futre. It's been a lot of fun exploring this environment. I'm hoping that things will stay pretty stable at this point because I'm not a big fan of constantly retooling. But we'll see what happens. Until then, I'll keep exploring, and I'll also be putting out articles to help other folks get around any frustrations that I run into. Why cant every technology demo be like this? Minimal complexity, lots of explanation, simple to duplicate, practical. I have spent days googling MVVM, MVC, .NET, webAPI, Xamarin, and this would be the first useful page i have come across. Thank you for putting the time in.